Earle Labor earned international recognition for his comprehensive exploration of the life and work of novelist Jack London, including an award-winning biography, Jack London: An American Life. 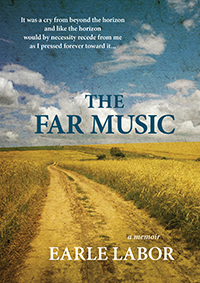 In his newest book, The Far Music, the scholar depicts the “golden age” of SMU and a special time in American culture. The release of his captivating memoir, published by DeGolyer Library, will coincide with Tables of Content on April 30 and will be the topic of discussion at a table hosted by Russell L. Martin '78, '86, Assistant Dean for Collections, Central University Libraries, and Director, DeGolyer Library. Attending SMU on an academic scholarship, he encountered a campus transformed by an influx of World War II veterans. With fellow English major P. B. “Pink” Lindsey, a former combat infantryman at SMU on the GI Bill, Labor took to the open road, chasing crop harvests from Canada to the Corn Belt. Along the way they encountered colorful characters and experienced the growing pains of post-war America. “You’ll feel like you’re on the road with him, longing for days gone by,” writes Judy Christie of The Shreveport Times. Labor received the Edgar A. DeWitt Achievement Award as SMU’s Outstanding Senior Man in 1949. He went on to achieve his dream of becoming a college professor. Labor, Emeritus Professor of American Literature at Centenary College of Louisiana, started teaching there in 1955.